Today, CCA-sponsored legislation was introduced by Assemblymember Eduardo Garcia (D-Coachella) to provide a streamlined and cost-effective pathway for ranchers to obtain a water right for currently-constructed stock ponds with a capacity of no more than 10 acre-feet. AB 448 will renew a certificate program that was established in 1974 and expired in 1997 that enabled ranchers to obtain a certificate with the filing of an application and the payment of a one-time fee. The certificate program established under AB 448 will be open to those with currently-registered stock ponds and those that do not have a water right. Those with registrations or who have filed for registration will be given seniority based on the date the registration was issued or filed. The current registration program is cumbersome and costly and requires the payment of an annual renewal fee for each registration. The certificate program offers a “one and done” opportunity for ranchers to obtain a water right for stock ponds with a capacity of 10 acre-feet or less so long as the pond was constructed prior to January 1, 2019. 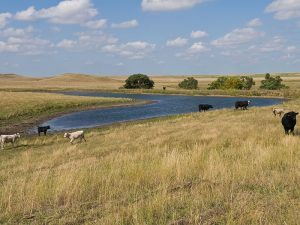 Should the bill pass and be signed into law, ranchers with applicable ponds will be given two years to take advantage of the certificate program; after 2021, ranchers will need to obtain a water right under the registration process used now. CCA sincerely appreciates the leadership demonstrated by Assemblymember Garcia, who also serves as the Chair of the Assembly Water, Parks & Wildlife Committee. In addition, CCA is grateful to Assemblymembers Susan Eggman (D-Stockton), Frank Bigelow (R-O’Neals) and James Gallagher (R-Yuba City) for coauthoring the bill. The first hearing for the bill has not been set but is likely to be scheduled for March or April in the Assembly Water, Parks & Wildlife Committee. Click above to read an article and get the facts on stock pond regulations from Kirk Wilbur, CCA Director of Government Affairs.